doi:10.4236/ijcns.2010.36072 Published Online June 2010 (http://www.SciRP.org/journal/ijcns/). bining diversity techniques. Performance analysis of the system with these detect ion techniques is presented. on the performance of wireless communication systems. severely obstructed by buildings, mountains, and foliage. power is considered to have zero-mean, amplitude fading. the LOS component is negligible. A. J. BAMISAYE ET AL. 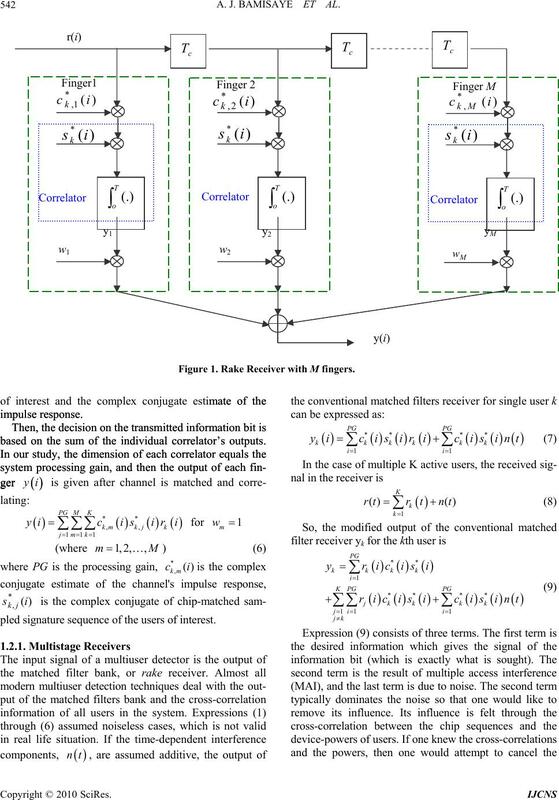 sed on the sum of the individual correlator’s outputs. nature sequence of the users of interest. Figure 1. Rake Receiver with M fingers. intuitive motivation for interference cancellation scheme. vides the optimally achievable performance reference. rameters are updated randomly in each loop. 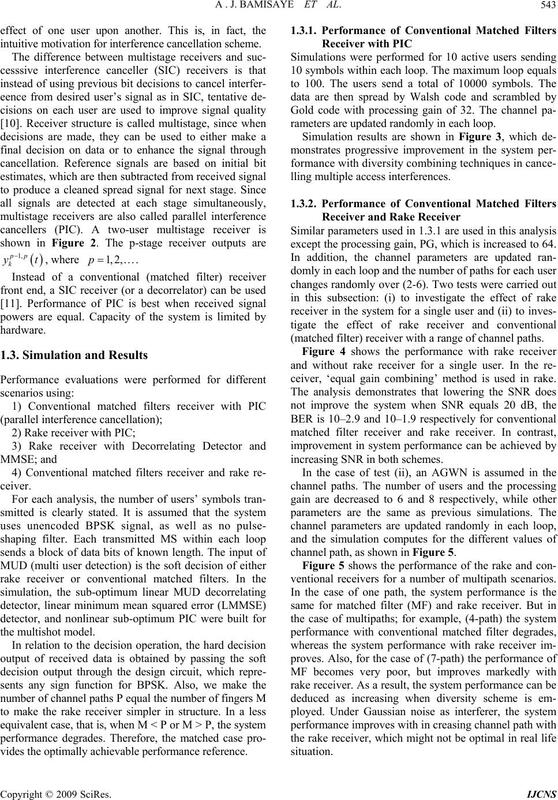 except the processing gain, PG, which is increased to 64. 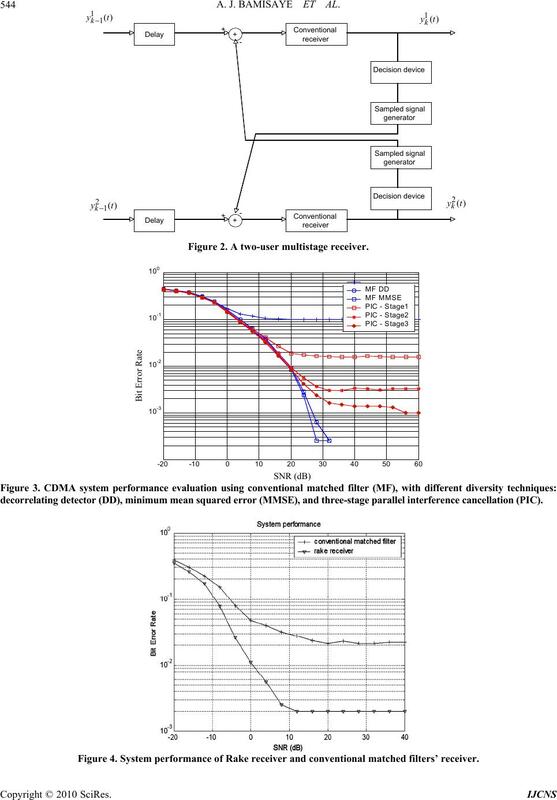 (matched filter) receiver with a range of channel paths. 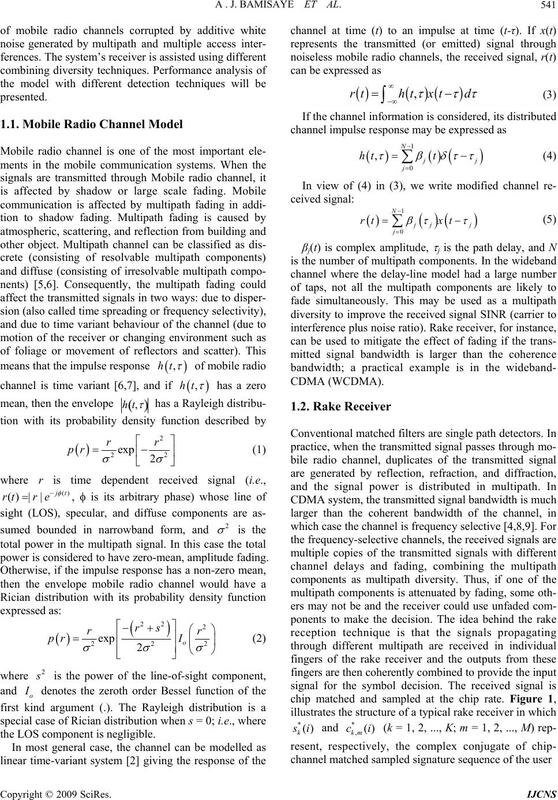 increasing SNR in both sche m e s.
channel path, as shown in Figure 5.
ventional receivers for a number of multipath scenarios. Figure 2. A two-user multistage receiver. Figure 4. 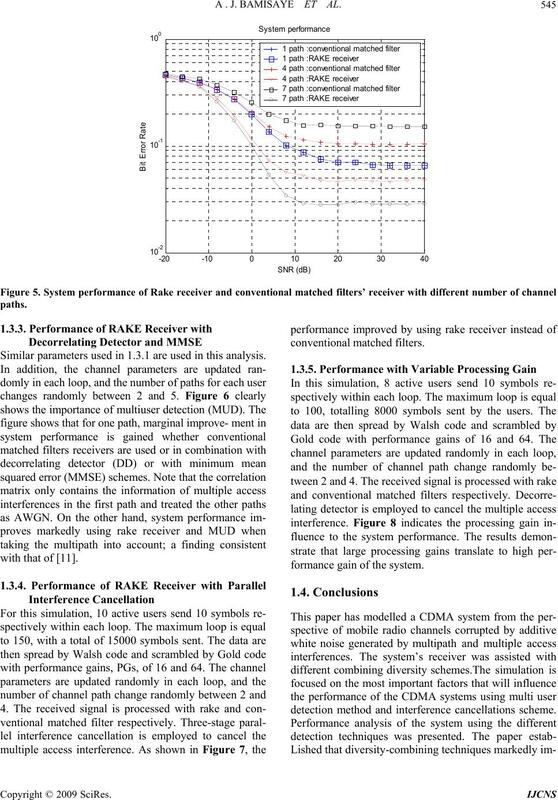 System performance of Rake receiver and conventional matched filters’ receiver. A . J. BAMISAYE ET AL. Similar parameters used in 1.3.1 are used in this analysis. formance gain of the system. detection method and interference cancellations scheme. imum mean squared error (MMSE). Figure 7. 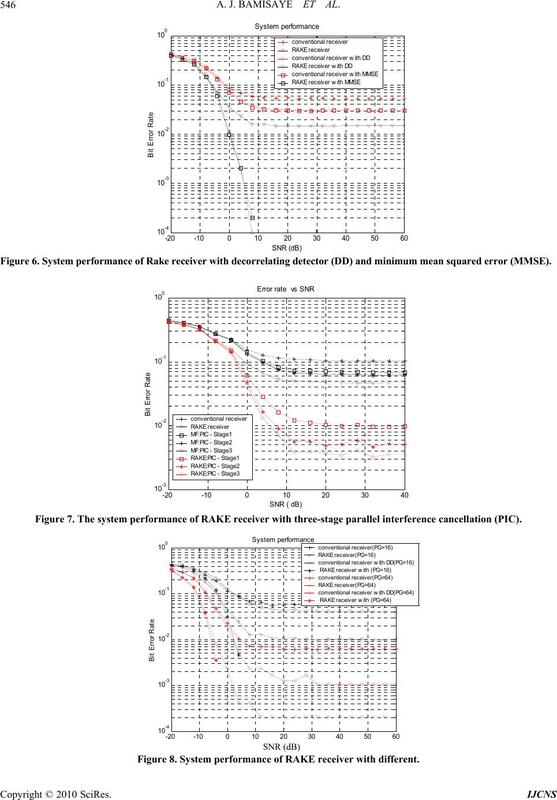 The system performance of RAKE receiver with three-stage parallel interference cancellation (PIC). ence, is the processing gain which the model employed. Federal University of Technology, Akure, 2009.
] 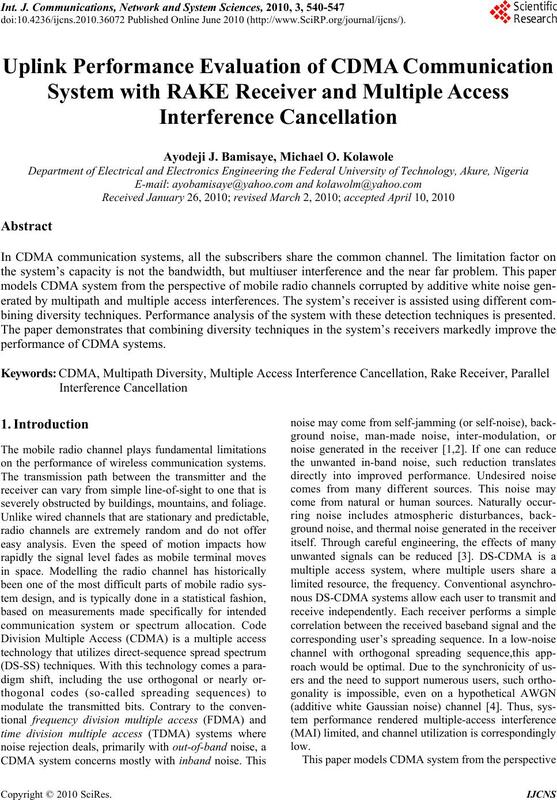 A. J. Bamisaye and M.
Journal of Signal Processing, Vol. 4, No. 3, 2008, pp. in Communication, Vol. 16, No. 9, 1998, pp. 1765-1773.
tions, Vol. E89-B, No. 4, 2006, pp. 1455-1458. [5 O. Kolawole, “Evaluation of 1940.
work Journals, Vol. 2, No. 1, 2010, pp. 1-6. 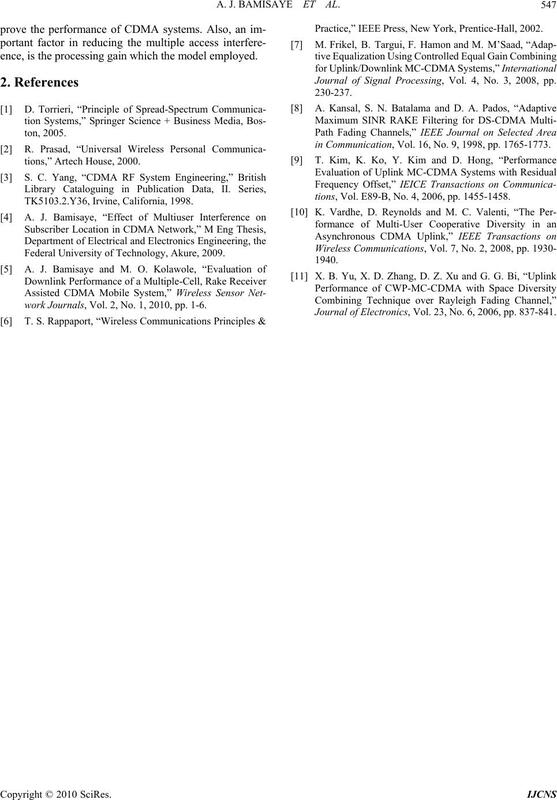 Journal of Electronics, Vol. 23, No. 6, 2006, pp. 837-841.